On December 8th 2018, Batley celebrated the 150th anniversary of the town being granted its’ own borough status. Over the coming months you will doubtless see numerous activities promoting this milestone. ‘BATLEY 150’ is the official name of this celebration and we would like YOU, our members to feel free to contact us if you can think of anything Batley-related that you feel should be mentioned and celebrated. 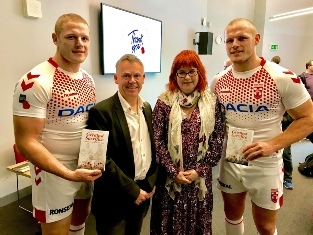 Our very own Jane Roberts and her husband Chris have had their book ‘The Greatest Sacrifice’ published to great acclaim and with the endorsement of the Rugby Football League itself. The book accounts for the casualties from WWI who had, prior to conflict starting, made their names in what was then known as the Northern Union. Other major sports have had books on the subject written but never had Rugby League been paid such an honour. Copies of the book can be ordered via Jane, the cost, including postage is £14.50. Payment can be made either by Bank transfer or by cheque. If you are local you can collect direct at a cost of £13.50 per copy. Go to Jane’s link on the CONTACTS page to order your copy (pasttopresentgenealogy). The book is also available to order from Scratching Shed Publishing and through all the usual book sellers. It is stocked by Philip Howard Books at Roundhay. Please check local press for full details….